Neeerfffsss. Creeper has fallen, and the ladder is up for grabs...Age of Empires references aside, there has been a shift in the force and what better way to celebrate that by looking at a new climbing deck? Secret Mage is definitely not a new build, but I think it is going to be the best deck for the new meta. I have been cruising up the ladder in my early testing, and I can confidently say that this list has a good matchup against all of the current popular builds. Of course, this deck has some key differences from past builds, but that's to be expected. It is not just about playing a good deck, it's about finding out why it's so strong at this current time. Kabal Lackey Though we are going to cover a few cards here, I do not think any are as important as Kabal Lackey . 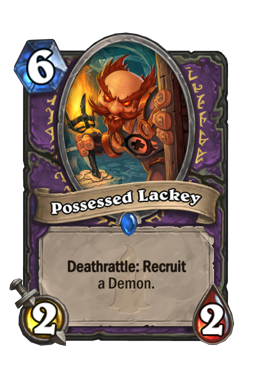 In my early testing, it seemed that Lackey was going to be one of the most important cards moving forward. That is because the nerfs are going to set back a lot of tempo decks, which in turn should then split the meta in half between fast aggro and slower control. While we have a handle on the slower builds, the faster ones (especially Hunter and Paladin) can be tricky. Lackey fixes that issue by giving this deck a way to actually use secrets to get ahead of the opponent. Even turn three can be a bit slow in some games, but having a 2/1 and a tempo play on turn one can wreck a lot of carefully laid plans. Just about every secret in this deck is a tempo play of one sort or another. Some are better suited for different situations, but overall they are about cementing your board and pressuring your opponent. Being able to hit your opponent's two drop with Explosive Runes gives you both removal and critical damage, while setting up a Counterspell for a turn three Animal Companion or turn two Wild Growth can debilitate your opponent's early game. Not only that, but you're also getting in a series of hits with your 2/1 while your opponent tries to play around your question mark. This deck wants to get in as much damage as possible, and an early secret is a great way to do that. 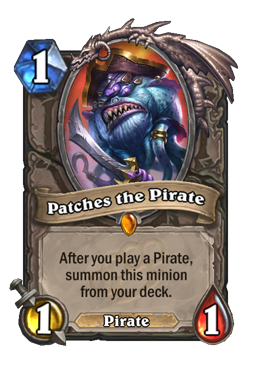 Another big plus about this card is that, with Patches the Pirate getting nerfed, it is going to be much harder for your opponent to easily kill. 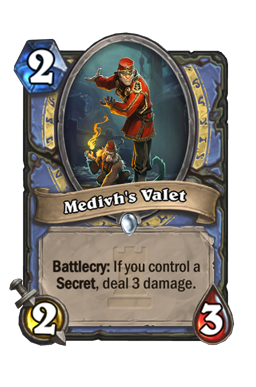 Medivh's Valet When talking about Tempo Mage, it is key to discuss Medihv's Valet because the card perfectly encapsulates what this list is all about. You are a fast deck, but you are also a burn deck. That means it does not take a lot for you to threaten lethal. Using your Valet to take down a three or four drop while after putting down a two mana Kabal Crystal Runner is all you need to take over a game. There are many decks that depend on small or semi-small bodies to hold onto a board. For that reason, this card is one of the best ways to take back lost priority. Always see what your opponent might play, and try your best to set their minions up for Valet. For instance, playing an Explosive Runes /Valet on turn five to kill a Duskbreaker is a fantastic way to respond to the AOE and keep yourself moving forward. Be patient here. It is easy to try and set up Medivh's Valet as soon as you possibly can, but a lot of the time you have better things to do with your mana. Yes, you are only going to be able to play this in the same turn as a secret, but your secrets also do not need to come early. There are many decks that depend on the top end of the curve, and if you pace the early game you can use your secrets to threaten the mid-game. It is also important to remember that the 2/3 does damage. Pushing this at face can be a great way to put together lethal on two different fronts (face and the board). Finally, do not be afraid to play Valet as a two drop. So many people will shy away from that because they want to use the ability, but Hearthstone is, and has always been, about a good curve. A body is always better than an early hero power. Mirror Entity This is largely a flex spot, and not one I'm sure what to do with. There are always different options you could run here, but I think I want a fifth secret. This deck rarely cares about weapon removal and Spellbreaker shouldn't matter because Warlock is likely going to be your best matchup. 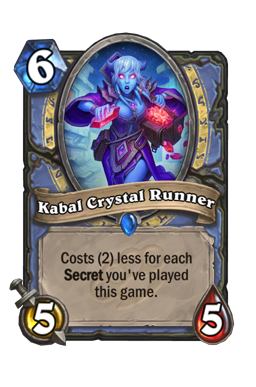 An extra secret not only adds to your overall consistency, but it makes it so you have more chances to trigger your Kabal Lackey s, Kirin Tor Mage s, and Kabal Crystal Runner s. Mirror Entity seems like the obvious choice because it is a great tempo card that is also fantastic off of the double Kabal Lackey package. 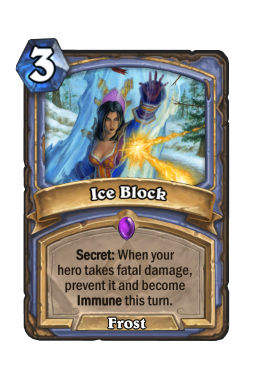 However, there is also a chance this could be Ice Block . I think this choice is largely going to come down to the way the meta shapes up. If there are a lot of hyper-aggressive decks attempting to kill Warlocks before they get set, you probably want to run block. 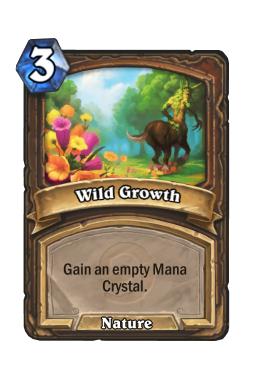 However, if most of the meta is slower decks or things like Jade Druid, I would definitely roll with Entity. Six secrets is likely too much for what you're trying to do (you never want to bog down your hand), but getting that extra one to smooth out your mulligans seems key. 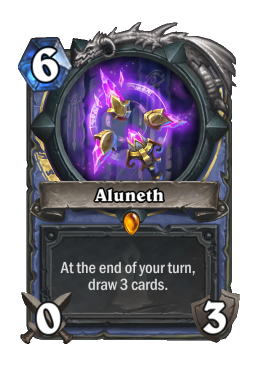 Aluneth Another card that we have to discuss in terms of playing Secret Mage is Aluneth . 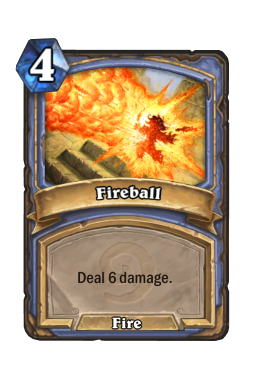 Everyone knows the power of this six mana weapon. Holding it for two or three turns is typically going to be enough to close out any game, regardless of what your opponent is up to. However, it also does nothing to impact the board or apply pressure. That is a bit of an issue for this build because you always want to put on damage in one way or another. To offset that inherent tempo loss, make sure you have control of the board or the game before trying to make Aluneth happen. This is not just a card you want to run out, but rather one you need to have a solid platform for. On the above note, it is important to treat Aluneth as a finisher. That is to say, do everything you can to set it up, and play to it as much as you possibly can. There are going to be windows where your opponent has a weak turn or when they have lapses in their curve. That is where you want to sneak the weapon in. However, you can also create those windows by pressuring your opponent and building up a big board. Aluneth is not a card you play when you have six mana, but it is a card that you always play when you have a clean opportunity to do so. The only exception to that rule is when you desperately need burn to close out a game. In that case, go with the six drop and hope it finds you finishing damage. The Burn The most important part of piloting this deck is knowing when and how to use damage. We've touched upon this in the past, but it so important that it is worth revisiting. You are a burn deck. 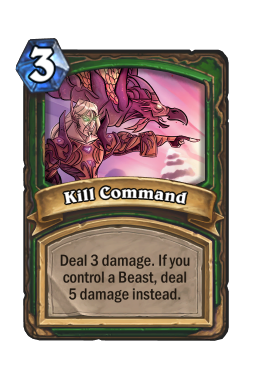 Yes, some people may think of this as aggro or tempo, but in reality you are built around your various ways to kill your opponent through spells. Your goal is not to advance the board or push through small threats, it is to get onto the board early and use your secrets to set up and play minions. Once that happens, your opponent will then be forced to use their turns answering threats while you chip them down. 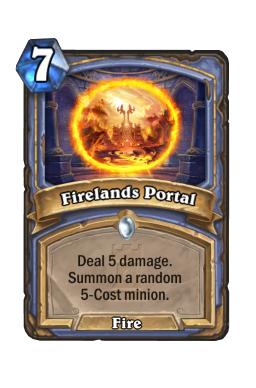 By the time they stabilize, you should be able to finish them off in a flurry of Fireball s, Frostbolt s and Firelands Portal s. See this deck like the old Aggro Shaman builds. Thrall was powerful because your had to answer the board and if you didn't, you would die. However, as you spent time trying to get everything under control, you would fall into burn range and get killed before you could make anything happen. This deck is built on that exact same principle, except your burn is much stronger. View your minions as more distractions than anything else. You are not playing your free Kabal Crystal Runner or mid-game Medivh's Valet as serious threats. You're playing them so your opponent will use their mana to do something other than heal or apply pressure. Of course, there are going to be times where you use burn to cement your board. However, you only want to take that path when the minion you're protecting is going to end up being more damage than the burn you're giving up. The four decks I've seen the most in the early post-nerf meta. Control Warlock Control Warlock is the best reason to play Secret Mage right now. The nerfs left Gul'dan basically untouched, a fact that he is taking advantage of in all the right ways. Both Combo and Cube are popular in the early days of the new ladder, and I assume they will both only get more popular as time goes on. That is wonderful news for us because, though Warlock has some healing, it is often not enough. This game is going to play out the same way nearly every time. You play some threats, your opponent taps, and then you kill them with burn before they ever get set. Even if they do make it to turn seven, eight, or nine, they often need to choose between playing defensively or getting things onto the board. They will eventually try to advance their gameplan, and when they do that you will kill them. As easy as this game is, it is only a breeze if you pace it in the right way. Warlock has a very strong turn six (which is when they can kill off their own Possessed Lackey ) and they also have their endless Voidlord s. As such, you always want to end this game by turn six. That may seem like a tall order, but it's much easier than you think. Run out all of your minions, regardless of their ability or strength, and do everything you can to put pressure on your opponent. The biggest goal here is to never have to use your hero power. 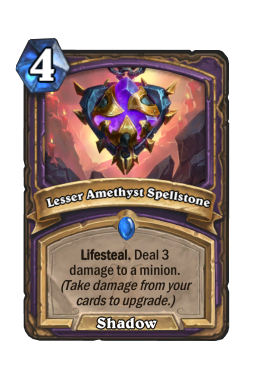 Warlock almost always starts out slow by damaging themselves, and you want to answer that by setting up things like Counterspell or a big Mana Wyrm . Just never play too much into things like Defile or Hellfire . Two minions should be more than enough to help you push the board. Big Spell Priest Another correct prediction by yours truly, Big Spell Priest remains quite popular after the nerfs. Like the Druid deck I covered on Weekly Legends, though they lost some of their key pieces, the deck still has more than enough key pieces to carry them. This is a strange game that is going to change depending on how your first turns play out. If you get on the board early with a strong minion push, you want to clear aggressively (to limit combos) and keep going with your bigger and bigger bodies. However, if things ever slow down, you need to try to push and play to your burn. 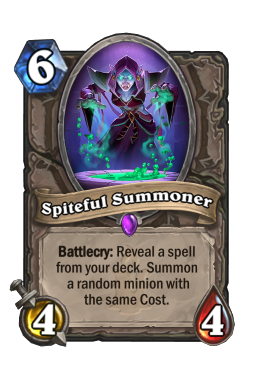 It is easy to get complacent when you have control of the game, but Spiteful Summoner is extremely difficult to handle. Do not let the 4/4 blow you out. As with Warlock, this is a game where you want to get pressure on your opponent going to into turn six. 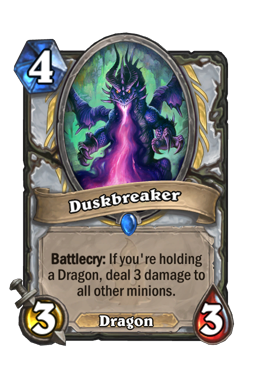 The only other thing you need to watch out for in this one is Duskbreaker . 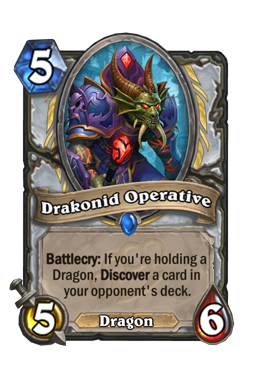 The dragon is a big deal because it is the only way Priest can take out or answer a fast opening. All of your early minions have three or less health, which allows the 3/3 to crush you if you aren't ready. Typically, it is best to set up an Explosive Runes before it comes down. On that note, runes obliterates Priest by forcing them to take damage and lose tempo. They are a deck that wants to tap out each turn, which means you want to use the secret between turns three and five if you can. 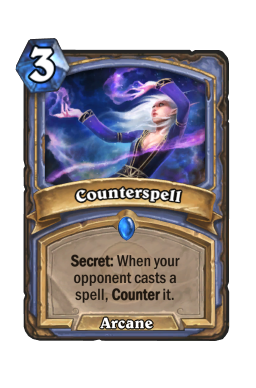 Finally, while Counterspell may seem useless, it does a great job of stopping any spells your opponent might take from Drakonid Operative . Setting one up for synergy before turn six can be a good way to offset the 5/6. Aggro Paladin When first piloting this deck, I assumed that Paladin would be one of the easiest matchups. They are a fast tempo deck that need to cement early board control to build their strong mid-game. Your tools seem to counter than plan quite well. However, this game is actually quite tough because, if you ever falter, Uther will bulldoze you. 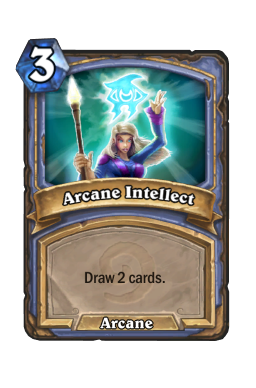 One of the best things about Secret Mage is that you don't need to go one-two-three to be good. You can bounce back from slow openings or awkward hands. However, that does not work in this matchup. You need to get bodies out early, mulligan for small threats, and aggressively push for tempo. Clear, but do so in a way that also helps you get in consistent damage. Merely clearing over and over will eventually give Paladin a window to climb back into the match. 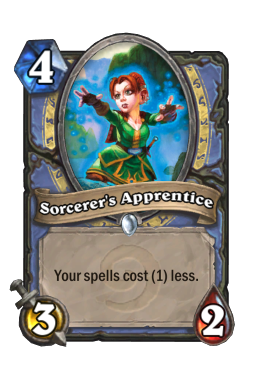 If you have the option of playing Counterspell before turn four, you should. Call to Arms is unbelievable strong against your deck, and there is almost nothing you can do if your opponent hits it while they have tempo. Getting a strong Counterspell completely blanks your opponent. 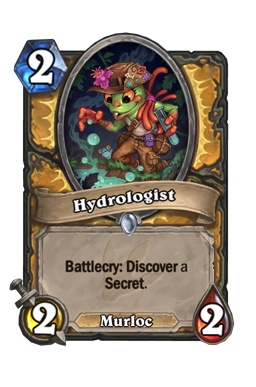 Just be careful about Hydrologist , as the secret can trigger yours. 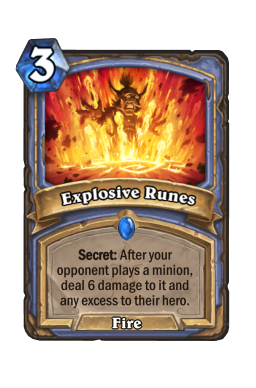 Another strong card in this one is Explosive Runes , which does a great job of shutting down your opponent's threats. 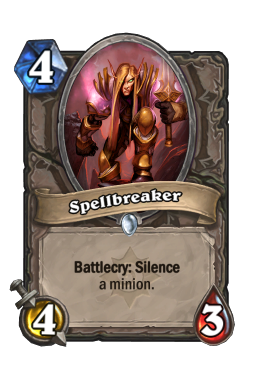 That is the best card to play off of an early Kabal Lackey . 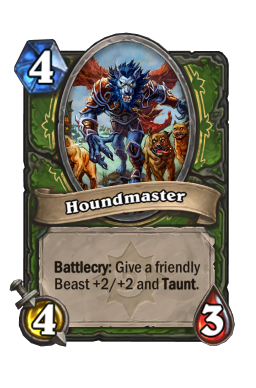 Midrange Hunter Hunter is back, baby. 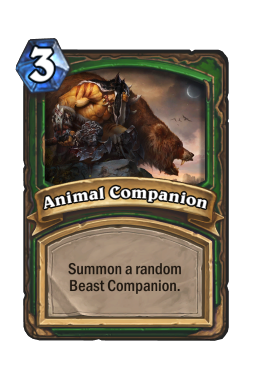 Rexxar always surfaces during times of flux to prey on people experimenting with new decks. However, we are not playing a new build. In my climb with Secret Mage I can safely say I only lost to one Hunter, and that was an all-spell build that I just did not see coming. Most Rexxar decks you'll face are going to be midrange, which you have a gigantic advantage against. Not only is your early game better suited for board control, but they have a nightmare playing around your secrets. The class also has no healing, which means you can liberally play to your burn without worrying about getting set back. The biggest part of this game is to never let Hunter take over the board until you're confident they cannot outrace your burn. You have a lot of good ways to trade early on, and you should do so as much as possible. 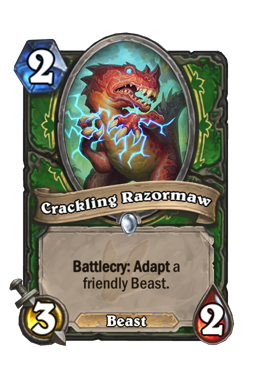 Even using your hero power can be right if it denies synergy cards like Houndmaster or Crackling Razormaw . Pace early on, and then as soon as your opponent hits their middle game, bash their face in. 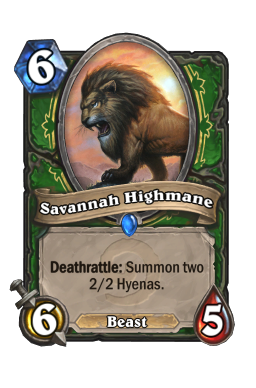 This game is almost always going to end in a flurry of Fireball s, which you want to get going before beasts like Savannah Highmane come to town. Mulliganing with Secret Mage is the same it has always been, which means you want to do everything to keep the curve intact and start early. Kabal Lackey , Mana Wyrm , Arcanologist , Frostbolt , and Sorcerer's Apprentice are your must-keeps, and you should always keep Medivh's Valet when you have a weak opening. 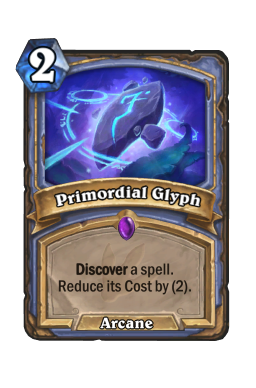 Primordial Glyph is great with a minion, but I've been keeping it on its own more and more as of late. 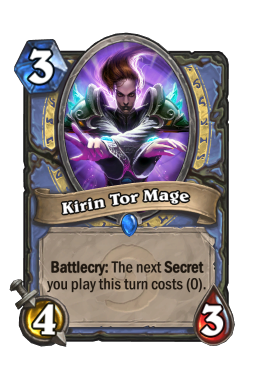 Kirin Tor Mage should always be kept with a secret, Arcane Intellect is good on curve against a slower deck, and Kabal Crystal Runner is great on curve after an early secret or two. 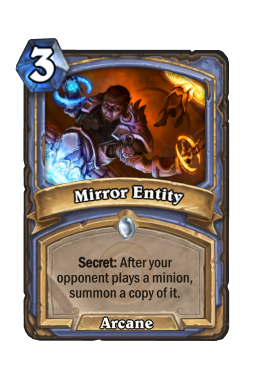 Note: While you may want to instantly throw back all your secrets, you have so much secret synergy that they can be kept if they are going to particularly helpful in the matchup at hand. I am not the biggest Secret Mage player, but I love exploiting holes in the meta. I have met very little opposition with this build, and I expect that trend to continue as more and more people adopt Warlock and Hunter. In addition, tempo is extremely fun in this build because there are so many cool micro-interactions to play with. 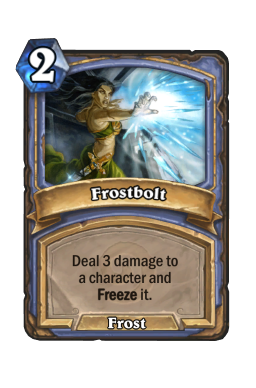 Even if you're cold on the deck, as soon as you go turn two Kabal Lackey /Explosive Runes into coin/Medivh's Valet to kill your opponent's one drop you'll never look back. Trust me. 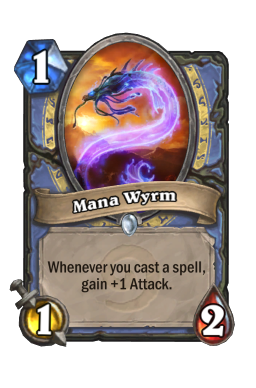 Until next time, may you always roll a turn one Mana Wyrm .